Mehdi Daoudi, CEO of Catchpoint, a digital experience intelligence company, noticed an interesting phenomenon following the implementation of the GDPR last month. Outlets based in the U.S., like USA Today, which developed a separate site to comply with the new regulations while still serving their E.U. audiences, were showing a much faster download time. The reason was simple: These outlets had stripped their sites of nearly all third-party ad services, with some sites delivering no ads at all. Many that are displaying ads, including Slate, New York and The Financial Times, are using Google Ads, “which has had an advantage in securing user consent to display targeted ads,” says Daoudi. “GDPR’s impact on media outlets is creating even more upheaval for the online news industry, which faces ever-increasing demands for fast download speeds,” Daoudi told Publishing Insider. Daoudi provides USA Today—which displayed no ads on its site—as a prime example of how, when fewer third-parties are attached to a site, the user experience becomes much better. Around the time the GDPR went into effect, USA Today’s E.U. version was showing a download time of .42 seconds in the U.K., .75 seconds in France and .51 seconds in Germany. This comes in comparison to an average load time of 9.86 seconds in the U.S. edition. “Unfortunately, sites relying on monetization through advertising don’t always have a lot of wiggle room when it comes to slimming down their sites. The key for them is applying site optimization techniques that help minimize the negative impact of heavier pages and a multitude of third-party services, particularly ad servers,” he says. Some media brands, like Outside, are finding ways to slim down their websites and see better user engagement and faster download times as a result. 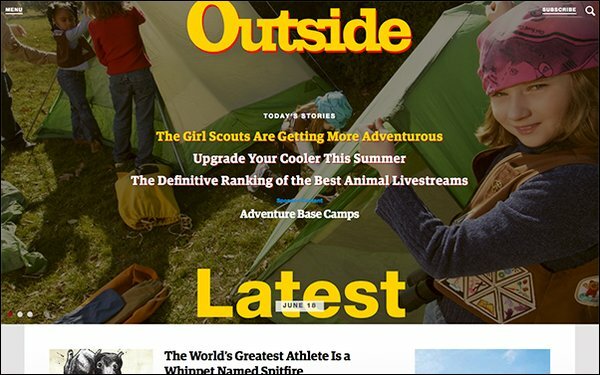 Earlier this month, Outside unveiled a redesigned homepage that downloads about 50% faster than the previous design, though Todd Hodgson, director of product management, adds it depends on the ad creative that loads, too. Outside reduced the number of links on its homepage by over 50% after analyzing a year’s worth of data. The redesign ran through a four-week A/B test of the new vs. old homepage, with the new clearly outperforming in user engagement. Outside also created new opportunities for advertisers in the process, including opportunities for native advertising. Though daily impressions dropped by 40%, ad engagement spiked by 60%. “Quality and value of the homepage ad impression increased due to higher ad engagement,” says Hodgson. “Since Outside impressions are priced on value of quality, this will lead to higher homepage CPMs and an increase in advertiser demand of homepage impressions. The newly designed homepage also “yielded a 5% better bounce rate,” exceeding expectations. By decreasing the bounce rate, Outside is able to deliver higher-quality ad impressions throughout the site, as more users reach the internal site.